Last Tuesday, Apple announced its revolutionary new mobile phone, the iPhone. The iPhone combines a cellular telephone, a digital media player, and an internet appliance into a sleek iPod-like handheld device that is set to become the next must-have item for the fashion-consious technophile. The iPhone introduces several important technological innovations that set it apart from other so-called “smart phones,” and at present, the iPhone has no rival that can match its capability and ease-of-use. I will categorize these innovations under design, user interface, applications, and integration. Apple is famous for its groundbreaking industrial design. From the original Mac to the iMac and the iPod, Apple has shown the rest of the industry how to make great-looking and fun-to-use devices. The iPhone is like a modernized combination of an iPod and a Newton. 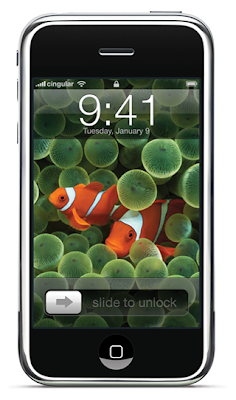 The sleek and solidly-engineered stainless steel and aluminum case of the iPhone just begs to be held on one's hand. It's a bit large compared to some smart phones, but one doesn't get the feeling that any of the space is wasted. Most of the front of the device is devoted to the gorgeous display. The display is an innovation all by itself. Its 160 dpi resolution offers unprecedented clarity and detail for a device of this kind. The absence of a mechanical keypad may seem unusual at first, but it seems like a smart move. Why waste space on the device with lots of different buttons when the screen itself can be any button you like? I'm confident that Apple is ahead of the curve on this one, and that other mobile phone manufacturers are already scrambling to catch up. Apple's Multi-Touch user interface system is remarkable in its simplicity and intuitiveness. One flicks through lists like one might flip through cards in a Rolodex. On pinches to zoom in or out, just like pinching pizza dough to compress or stretch it. When I saw Multi-Touch in use the first time, my first reaction was “That's so obvious it's a wonder that no one thought of this before.” Once again, Apple has created an interface paradigm that works so well you don't have to learn how to use it. The integrated accelerometer and proximity sensor are also important innovations. Turn the iPhone sideways and the interface flips automatically. Put the iPhone up to your ear and the touch screen is deactivated. These features are so obvious that users will wonder how they ever used devices that lacked them. User interface eye candy is abundant. Transitions are smooth. Interface elements slide, fade, flip, and zoom to reveal new information. The user interface is a pleasure to behold. These niceties make using the iPhone a pleasing — almost relaxing — experience, and convey the impression of a well thought-out and carefully-designed device. The main applications of the iPhone are mobile telephone, music player, and internet device. The iPhone delivers innovations in each of these areas. These innovations set the iPhone apart from other smart phones on the market today. The phone features are simple and intuitive. Making a call, switching from one call to another, joining together two calls into a conference call, switching to speaker phone — all of these functions are simple and easy to perform. As a music player, the iPhone builds on the best features of the iPod but also adds some nice capabilities from iTunes, such as Cover Flow. I'm sure that the iPod features work well; this is the area in which Apple has the most experience when it comes to mobile devices. Lastly, the mail and web features of the iPhone work pretty much the same as Mail and Safari do on the Mac. Apple is clearly hoping for another “halo effect,” and I think the iPhone offers a great opportunity for this. Once users have a chance to see how well mail and web applications work on the iPhone, they'll be more confident about how well these functions work on the Mac too. Although not talked about much, the iPhone also incorporates a small 2 megapixel camera. It will be interesting to see how photos taken with the camera look. The iPhone is tightly integrated with other applications and systems. The contacts are synced with one's address book (I suppose this means a version of Address Book.app is coming to Windows); and music, photos, and videos are synced with iTunes. Apple's visual voice mail is yet another obvious innovation; it will allow folks to listen to the one voice mail in which they're interested, rather than having to listen to them all in order. The iPhone is also integrated with Yahoo mail and Google maps. On the phone, the applications are also integrated well with one another. For example, copying a photo from one's photo library to an email message is a simple matter. The iPhone represents a big step forward in the area of integration. I have several concerns about the iPhone's limitations and drawbacks; and I will group them into four categories: battery, storage, camera, and openness. Although Apple has said that the iPhone will have 5 hours of talk/play/browse time, the company has made no comment how long the battery lasts when the phone is not in use — in other words, the length of standby time of which the phone is capable. During his keynote address, Steve Jobs rightly pointed out that the “killer app” of a cell phone is making calls. But having a phone that works when you pull it out of your pocket is an important part of that, and most mobile phones have a standby time of many days. No one wants to be required to charge his phone every day. If the standby time of the phone is only a couple of days, this will be unacceptable to many people. The battery is not user-replaceable; this is especially worrisome when one remembers the high fee Apple charges to replace the battery in an iPod. This also means that it won't be possible to carry a spare battery or two when one is away from civilization for many days at a time. The phone has somewhat limited storage compared to the video iPods; if this phone is truly intended to play widescreen videos, it needs to have the capacity to store them. There is no expansion slot and seems to be no way to add extra memory to the phone. With the falling prices of flash memory, it seems like a no-brainer to include an expansion slot in the phone so that the user can add the amount of additional storage he needs. Considering that small pocket cameras are now averaging five to six megapixels, it seems odd that the iPhone's camera will be capable of only two megapixels. And when one beholds the lovely display on the front of the unit, one is at a loss to comprehend why Apple did not devise a way to facilitate iChat-style video-conferencing with the iPhone. Perhaps two cameras (one front, and one back) would have been too costly. A camera that can be flipped from backward-facing to forward-facing was surely an option, but this might have been seen as taking away from the simple, solid feel of the device. Improvements along these lines are surely destined for future revisions of the iPhone. Apple touts interoperability and adherence to open standards, but pays only lip service to these ideals when upholding them would conflict with the the company's goals and its relationships with other big players. For example, the iPod is a closed system because this allows Apple to lock iPod users to the iTunes software and iTunes store. And Apple's contrived system that makes it difficult to move ones music around was certainly a concession to the RIAA. Why is it easy to share photos, but not audio files? Simply because the RIAA is a more influential lobby than the photographers' guilds. It seems that the iPhone will represent one further step away from openness for the company. At least initially, the only way to get the iPhone will be to sign up for a two-year commitment to the Cingular cellular network in the United States. This may simply mean that the user is contractually locked-in to using Cingular; but it may also mean that the iPhone will locked to the Cingular network. I realize that Apple probably relies on its agreement with Cingular in order to keep the price of the phone down, but eventually people will want to be able to use the phone with other networks. Also, Cingular doesn't exist in Europe, so it remains to be seen how Apple will release the phone outside of the U.S. Will the iPhone be locked to another mobile network in Europe, and if so, which one? Steve Jobs said in his MacWorld keynote speech that the iPhone will run Mac OS X. He mad a big show of the various Mac OS X technologies that the phone will use, at his mention of CoreAnimation would appear to suggest that the iPhone will be running a variant of Mac OS X 10.5, “Leopard.” However, it seems that calling the phone's operating system Mac OS X was really more of a marketing decision than an accurate description of reality. Unlike a Mac, the iPhone will not be open to third-party software development. In other words, you won't be able to install and run on your iPhone applications that were not designed by Apple. This is too bad, because one could imagine all sorts of useful third-party applications that could be developed for the iPhone, for example, a program that allows text input using a stylus, or a program that allows video-conferencing (when used, say, with a mirror contraption that lets the camera face the user). An open platform would encourage innovation and allow developers and network providers to offer competing applications and services; a closed system helps Apple to keep the backing of the big media companies and allows it to cut lucrative deals with its chosen network provider. It remains to be seen whether the iPhone will be an open or closed system.